Do you get overwhelmed by complicated recipes with long ingredient lists and tons of steps? Or maybe you just prefer to keep things simple and easy in the kitchen because life is complicated enough as it is. We feel you. And have a hack we think you'll LOVE, along with a nutrient-dense recipe that will keep you feeling nourished and well this autumn season. 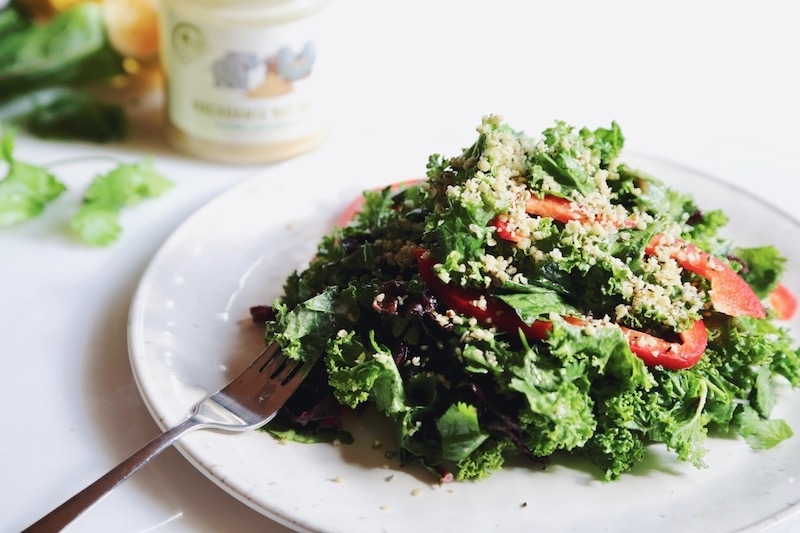 This salad is rich in so much nutritional goodness - specifically the trace minerals that many of us simply don't get enough of. Minerals are critical to our overall health, for healthy nerve and brain function, strong bones and teeth, our immune system, and so much more. Yet many of us are lacking in crucial minerals, even if we're eating healthfully. Modern agriculture has lead to nutrient deficiencies in the soil, which translates right over to our food supply. It's become even more important that we put extra emphasis on ingesting the foods known for their nutrient and mineral density - things like dark greens and sea vegetables. This salad has it ALL. Kale is rich with bone-strengthening vitamins and minerals like calcium, magnesium and Vitamin K - nutrients that most of us could use a little more of in our life. It's also a good source of Vitamin C for the immune system, Vitamin A for antioxidant protection and for the skin and eyes, folate (especially critical during pregnancy), and omega 3 fatty acids. It's also, surprisingly, a great source of protein at nearly 3 grams protein for 1 cup. It's high in fiber which acts as an intestinal "broom" to sweep waste from our GI tract, not to mention help keep us feeling full and our blood sugar balanced. Want to support your body's ability to detox heavy metals? Cilantro is your best friend. This flavorful herb (also known as coriander) is so much more than just a tasty garnish, it possesses incredible blood cleansing capabilities. Certain constituents found in cilantro can actually bind to heavy metal molecules and help loosen them from our tissues for more efficient detoxification. Not only that, but cilantro is also a wonderful source of antioxidants, vitamins, and minerals in its own right. Dulse is a tasty sea vegetable with a dark burgundy color. It contains a wealth of iron and is a natural source of iodine to support healthy thyroid function. Since it comes from the ocean it is full of literally all trace minerals - a great superfood to consume on the regular to give the body a flood of bioavailable nutrition. Just make sure you find a clean, sustainable good source - we love Main Coast. Dandelion leaves help support detoxification and healthy liver function. They also contain loads of vitamins C and B6, thiamin, riboflavin, calcium, iron (so good for the blood! ), potassium (a critical heart mineral), magnesium (bone, muscle, and cardiovascular health) and manganese. So why don't we see this superfood green in salad mixes more often? Well, to put it bluntly, it's bitter. Pairing it with a tasty dressing is key - more specifically, one that has plenty of healthy fats which help take the edge of the bitterness making things much more palatable. 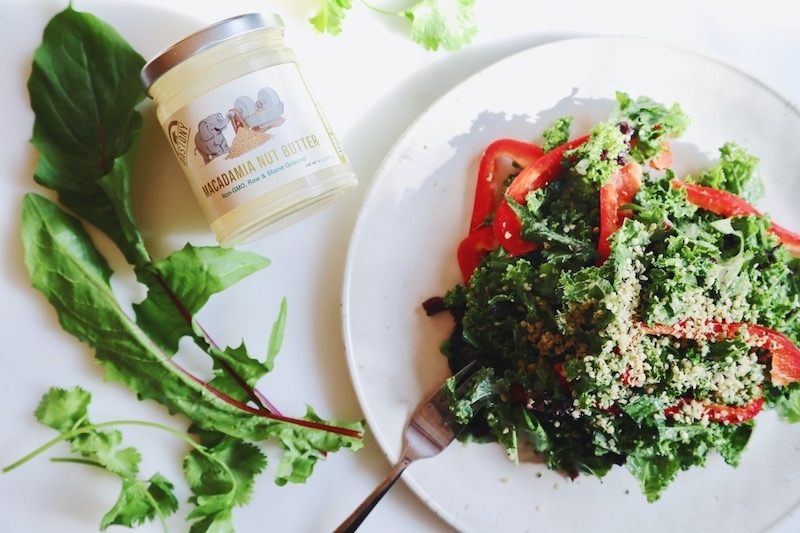 This recipe utilizes Dastony Raw Macadamia Nut Butter as the base for a super simple dressing that tastes amazing paired with the greens and dulse. 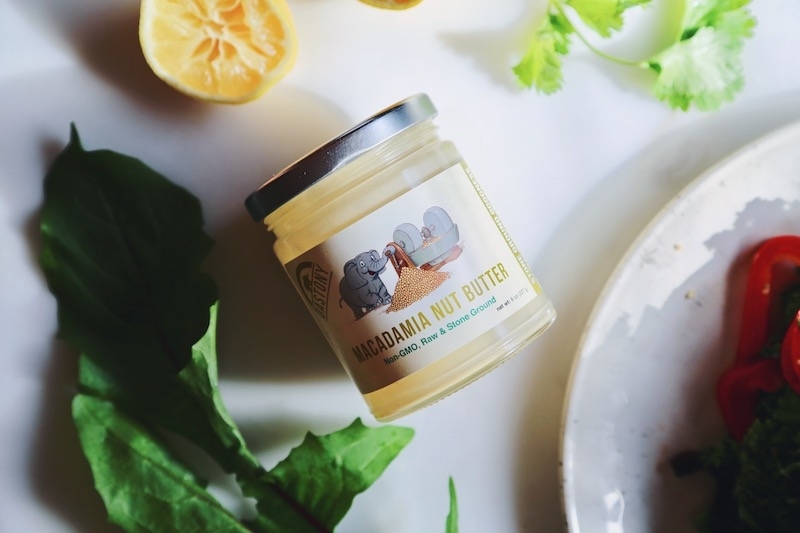 As a side benefit, the heart-healthy monounsaturated fats found in mac nut butter help all of those valuable fat-soluble nutrients like Vitamin K and A absorb more efficiently into our cells. Using stone ground nut butters as a base for easy dressings is an incredible kitchen hack for the "lazy chef". Simply mix in a bowl with a little lemon or lime juice, some shoyu or coconut aminos, your favorite spices, and a little water to thin if desired - that's really all that's needed. The silky, creamy texture of stone ground nut butter lends perfectly to sauce and dressing recipes. No blending required! 1. Prep your ingredients by washing and chopping your veggies, then place kale and dandelion greens in a big bowl. 2. Squeeze on some fresh lemon juice (about 1 Tbs) and a few pinches of salt, and massage with clean hands to help soften the greens. 3. Add cilantro, red bell pepper, and dulse and mix well. 1. Mix ingredients in a bowl. It's really that simple. 1. Scoop out nut butter mixture onto greens, and mix well. Serve with hemp seeds or pepitas on top. Enjoy!